Starving people is not caused by biofuel. It's largely a problem of distribution (means and financing). Both the US and Africa waste around 45% of the food they produce (one is 40%, one 50% - I think Africa is 40%). In the US we leave perfectly good food 'in the field' and throw it out when it's still consumable. We let it rot in our refrigerators and scrape the "too much" off our plates. In Africa a lot of production is lost due to inability to store and move food to market. That is not advocacy for biofuel for planes. Maybe biofuel for planes can help farmers handle the transition away from biofuels for buses. The issue with biofuel stealing food is mostly that subsistence farmers have a tendency of getting evicted for plantations. And biofuels are exacerbating that tendency. But on a much larger scale, get annoyed at biofood for animals: there's an awful lot of eviction and deforestation going on to grow soy for cows. Where are these people that are getting evicted for biofuel production? There isn't much biofuel being produced. More than 2/3 of the world's biofuel is produced in the US where there is still surplus production. Most of the other 1/3 of biofuel produced in the world is in Brazil from sugarcane. Far more forest destruction and crop displacement is for trashy "food" crops like palm oil grown to supply western consumers. I often wonder why there is so little consideration for biofuel for aviation to reduce (or eliminate) net carbon emissions from planes. It is proven technology which is mostly limited by high cost at this point. Turns out biofuels can also reduce other pollution currently emitted by jet engines. I believe I've read that when air travel was halted in the US in the days following 9/11, temperatures jumped by something like 2C? If biofuels don't emit as many sun blocking aerosols as our familiar kerosene derivatives, we might expect a temperature bump that would open the door to many feedbacks. Travis et al. (2002) did not control for the air-mass conditions across the US that may have been responsible for the observed increase in diurnal temperature range immediately following the attacks. By controlling for the air masses present across the US, we found that the unusual temperatures on 11 and 12 September were a result of a particularly clear weather pattern, not a lack of jet contrails. There's apparently still no definitive answer as to whether a cooling effect of air traffic, attributed to the contrail-cirrus merging-expanding phenomenon, is significant, or even measurable. The contribution of air traffic to anthropogenic radiative forcing, via emissions of several greenhouse gases is, on the other hand, rather unambiguous. Thanks Noob, I hadn't followed the story, but had assumed it to have been more or less true. I've been moderately concerned recently about the possibility of covert meddling in geo-engineering by party, or parties unknown. The aviation connection is the patterned flying we've seen signs of in the Arctic for the first time this year. 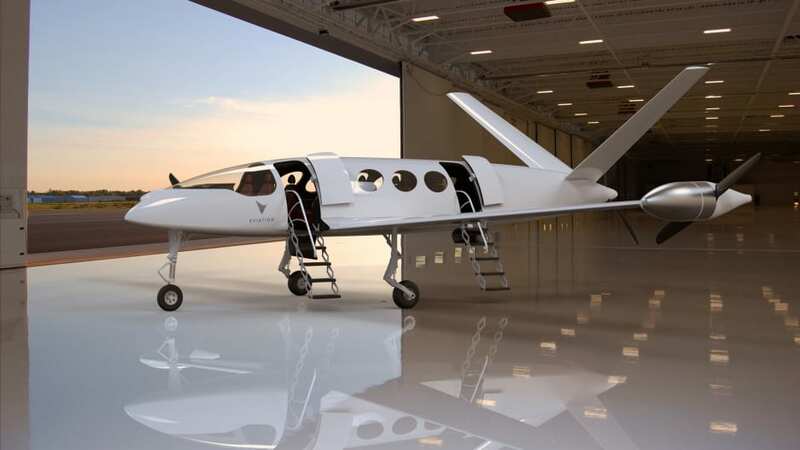 Earlier this year, US-based electric plane startup Wright Electric stepped out of stealth to unveil its vision to bring a short-haul all-electric aircraft to market. Today, they announced that British airline easyJet is joining their effort. The startup is trying the ambitious goal of building a battery-powered 150-seat plane to compete with 737-size aircrafts in the market for short-haul trips (under 300 miles). Electric VTOL drone aircraft, capable of carrying people, with a range of about 20 miles. I could see something like this being useful in situations like we currently have in Puerto Rico, to get supplies to -- and evacuate people from -- locations inaccessible by road. Maximizing cargo capacity by eliminating the pilot, once ground control is established at the site. The project they are collaborating on is the ‘E-Fan X’, a BAe 146 plane on which they are testing their electric motor technology. During ground tests, they already replaced one of the four gas turbines by a two-megawatt electric motor. In the E-Fan X, the electric propulsion system obtains its power from a generator that is powered by a turbine in the fuselage. Take-off and climbing will be supported by lithium-ion batteries, each of which will have 700-kilowatts of power. As a flying testbed serves a BAe 146 regional plane with one of the aircraft’s four gas turbine engines replaced by a two megawatt electric motor from Siemens. The maiden flight is expected in 2020. Through genetic engineering, researchers from the University of Illinois have produced a new form of sugarcane, called lipidcane, whose leaves contain 12 percent oil, instead of the natural level of 0.05 percent. They are working to produce a variety they call energycane, with 20 percent oil. The new plant variety could produce enough oil to produce biodiesel and jet-fuel economically, they write. In a recent study, we found that use of this engineered sugarcane could yield more than 2,500 liters of bio-jet fuel per acre of land. In simple terms, this means that a Boeing 747 could fly for 10 hours on bio-jet fuel produced on just 54 acres of land. Compared to two competing plant sources, soybeans and jatropha, lipidcane would produce about 15 and 13 times as much jet fuel per unit of land, respectively. If we devoted 23 million acres in the southeastern United States to lipidcane with 20 percent oil, we estimate that this crop could produce 65 percent of the U.S. jet fuel supply. Presently, in current dollars, that fuel would cost airlines US$5.31 per gallon, which is less than bio-jet fuel produced from algae or other oil crops such as soybeans, canola or palm oil. Reduce the number of miles flown per year with high speed rail and we might be able to fuel the flight we need this way. Cuba's sugar cane plantations could again become viable! Norway wants all short-haul flights be all-electric by 2040. Avinor, a state-owned company that operates most of the civil airports in Norway under the Ministry of Transport and Communications, made the announcement this week. Flying in the little Pipistrel electric trainer airplane, in Australia. More on the all-electric Pipistrel light sport plane. More photos at the link. Edit: my favorite feature: Regen! Recapture some of the energy from the (fixed pitch) spinning propeller during descent or when reducing airspeed. Cool. Commercial aircraft emit contrails that are estimated to create clouds that cover 10 % of Europe on a clear day. Contrails are also warming the atmosphere, according to research done by German DLR and NASA: "... contrails and the cirrus clouds that are formed as a result are thought to have a greater warming effect on Earth's atmosphere than the total carbon dioxide emissions that have accumulated as a result of air travel over the last century or more. ... Contrails contain many small ice particles that form due to the condensation of water vapour on the soot particles in aircraft exhaust gases. Contrails can linger for several hours in humid, cold conditions at altitudes of between eight and 12 kilometres, forming high-level clouds called contrail cirrus. Depending on the position of the Sun and the ground, these clouds can have a local warming or cooling effect. Knowledge of this is essential for assessing the climate impact of aviation. The research conducted thus far suggests that a warming effect is predominant globally." Aviation seems to be one of the worst contributors to global warming, and an industry that is more or less ignorant to CO2 emissions. Aren't you getting ahead of the research with that claim? AR5 has contrails being a relatively small amount, less than 0.1 C. And it can go away instantly if we fix the engines or reduce flying or whatever. Aviation is a few percent of global emissions. It’s definitely a part of the problem of course. Mustard seed oil to power aviation. Apparently they can get 400 litres of "fuel" per hectare, along with 1400 litres of diesel. They are testing it as a blend right now; presumably they expect to increase the blend. Some quick figures on the Ars forum: it would be about a million billion hectares to power all aviation from the biofuel (assuming they can be trusted to run a 100% blend) -- and then we'd have a btrillion and a half litres of biodiesel to power ships with or for emergency backup or whatever. Advantage of mustard seed: it grows in arid conditions. To be a solution there needs to be no fossil fuel involved. That was my thought as well. This seems very much like the corn ethanol idea. Yes, it means a bit less fossil fuel, but crops need to be grown for food, not fuel. Battery tech is improving so fast, these types of experiments will only be useful for short time. Good luck convincing someone to fly a passenger aircraft with a 100% synthetic fuel before testing with blends. : it would be about a million billion hectares to power all aviation from the biofuel (assuming they can be trusted to run a 100% blend) -- and then we'd have a btrillion and a half litres of biodiesel to power ships with or for emergency backup or whatever. Lunacy, utter and complete lunacy, to think a billion hectares of the earth's land should be switched to growing mustard so people on the planes can feel environmentally friendly. What / where billion hectares ? Currently growing food? Currently supporting other life? No downsides ? Biofuels is a con - belongs in "you can have your cake and eat it" pitch from the snake-oil salesmen. So give us your solution for rapid long distance travel. If you are asking for a solution that allows growth ad infinitum in long-distance aviation travel, the answer is there is not one. As the must-read posts suggest, there are wizards who believe technology will always be able to fix limitations on human economic activity, and there are prophets who believe that every system has its limit. Tis my opinion that we are a bit damn close to that limit for this planet, and fixing CO2 at the cost of everything else will not work. "solution for rapid long distance travel"
Do a lot less or none of it. It's never going to be sustainable for hundreds of millions of people to be constantly zipping around the globe, mostly for frivolous activities or things that could be done over the internet. It's time we just wake up to this fact and start scaling back our obsession over being somewhere else. The only way that I can see to make your solution work is to highly ration or outlaw rapid long distance. That could be done in an autocratic state like China but try it in a democracy and those elected officials would be rapidly voted out of office. Or you could tax jet fuel, which many states don't, and others barely do. And increase the tax nationally (couldn't find data ready at had on that). Article 24 of the [1944 Convention of International Civil Aviation] requires all contracting states not to charge duty on aviation fuel already on board any aircraft that has arrived in their territory from another contracting state. Further to this, the exemption of airlines from national taxes and customs duties on a range of aviation-related goods, including parts, stores and fuel is a standard element of the network of bilateral ‘Air Service Agreements’ (ASAs) between individual countries. Looks like it's time to renegotiate that old agreement! Of course a general tax on carbon would go some way in this direction. I do think, though, that at this point stronger measures are called for. 2nd Thoughts. A Billion Hectares required? That is 10 million km2, about the same as the land area of the USA (9.834 million km²). No way. So how much fuel does aviation use? 30.14 thousand barrels per day in 2012, Call it 32 by now. Jet fuel consumption - country data from around the world:The average for 2012 was 30.14 thousand barrels per day. The arithmetic below says that the required area would be just under 50,000 km2 (20% of the UK land area), 5 million hectares, producing just under 2 billion of jet fuel and 6.5 billion of diesel per annum ( not 1.5 trillion). If I am right with my calculation there is something odd going on. But bio-fuels are still a con. 3rd Thoughts re Mustard Seed for BioFuel. The push for this development is from Australia. Need 50,000 km2, and can grow in arid/semi-arid conditions. Queensland farmers are clearing vast areas of bush and forest (never mind the Great Barrier Reef receiving large quantities of sediment run-off). What to grow on it? Mustard !? Job done and bugger to the environment. gerontocrat: your link shows a lot more than 32,000 barrels per day. It shows 1,400,000 barrels per day for the US for instance. The figures I saw were about 5 million barrels per day globally. Having used the wrong figure for Global jet Fuel Consumption - I've done it again, using data from The International Civil Aviation Authority - 2016 Jet Fuel Burn. Burn is about 240 million metric tonnes per annum, density of jet fuel 840 kg per m3, gives 286 million m3 ('000 litres) per annum. Result, land required for 100% supply to the Aviation Industry:- 7.15 million km2, which is 93% of the land area of Australia (73% of the land area of the USA). Surplus diesel produced is 1 trillion litres per annum. Australia's jet fuel consumption is 2.8 million metric tonnes per annum, so land required is about 70,000 km2 - plenty of land cleared already in Queensland (due to reversal of environment friendly regulations) and is generally semi-arid so OK for the crop. Of note is that the ICAO predicts that on present trends consumption to rise to 700 million metric tonnes by 20050 (even on an optimistic scenario for fuel efficiency), which would need 21 million km2. Mustard seed can be grown in between crops of wheat. It would thrive off the residual fertilizer, need no water, protect the land from erosion, and provide additional revenue for the farmer. In 2016 the US used about 50 million acres for wheat production. That's about 200,000 km2. We'd need to look at other places where an oil crop might be grown when the land would otherwise be fallow. I'm not saying that we could do all the flying we do now on biofuel but when one sets out to prove something can't happen then they often fail to consider the possible ways it might. People who solve problems tend to not build a case for "Won't work" as their first step. The energy demands are quite large already, and expected to grow a lot as Asia and Africa get richer and increasingly become jet-setters like Americans and Europeans already are. We can't just grow mustard seed oil and jatropha on fallow fields or roadsides -- something else has to give. That something else could be synthetic fuel from marine or atmospheric CO2 (whatever's easier to collect). It could be a reduction in aviation demand by switching to ground transport (EVs, high-speed rail, hyperloop, sailboats -- whatever). It could be improved efficiency. It could be improved agriculture practices that allow growing fuel and food on the same amount of land where we currently only grow food. Or really, all of the above. Australia is a big place 7.692 million km², and a lot of it is arid or semi-arid. To repeat, Australia's jet fuel consumption is 2.8 million metric tonnes per annum, so land required is about 70,000 km2 - plenty of land cleared already in Queensland (due to reversal of environment friendly regulations) and is generally semi-arid so OK for the crop. Therefore may well be a viable option for Australia. I just get fed up when these things are pushed forward as a silver bullet to fix the whole damn problem. Defiance of the most cursory examination of the data plus total avoidance of any side-effects, (which oftimes demonstrate that the cure can be worse than the disease) is not a good basis for project implementation. "Mustard seed can be grown in between crops of wheat. It would thrive off the residual fertilizer, need no water, protect the land from erosion, and provide additional revenue for the farmer." I have grown another Brassica (canola) for oil. Broadcast seed into standing soy crop at least 2 or 3 weeks before the first frost. You can drive a combine over the seedlings without much harm to harvest the soy. The canola gets to the four leaf stage before the ground ices over. The in spring they jump out before the weeds do, so you might get away without having to use roundup ready canola. Harvest about June. But they will need fertilizer (thats why soy first, reduces total fertilizer demand for the two crops.) And water. I am fortunate that i dont usually need to irrigate, enuf precipitation. Transportation innovations are increasingly thinking outside the two-dimensional surface road limits. Elon Musk prefers going underground, to avoid the worry about a flying car landing on your head. But electric, automated aviation options are becoming more and more feasible. I'm interested but skeptical about all these flying car proposals. They all are basically personal helicopters; helicopters are bloody expensive in maintenance. Those aren't multi-motor electric so totally different maintenance regime. I agree conventional helicopters have expensive maintenance! But these new designs have short propellers, rather than long rotors. No tail rotors. And electric motors rather than ICE/turbine engines, and so have orders of magnitude fewer parts to break, and much less required maintenance. I don’t see big fleets of them either, at this stage. But this is just the beginning, so it will be interesting to see whether the autonomous air-taxi model becomes a thing over the next decade. The SpaceX BFR will be 30 feet in diameter and 350 feet (106m) long! Update: BFR work appears to be well underway! Again: the reason this is most immediately relevant to the Forum is that the BFR spaceship has the potential to provide intercontinental transportation without using fossil fuels, replacing some long distance jet aircraft flights. The rockets will use oxygen and methane, which can be sourced from atmospheric carbon dioxide via the Sabatier reaction. But in a real world would it be? Methane, natural gas, CH4, by whatever name has long been considered a fossil fuel. 2) The main reason for making the BFR is to get to Mars — and back. To get back to earth, fuel needs to be made on Mars. The Martian atmosphere is thin, but is mostly carbon dioxide. Musk has said that, using the Sabatier Reaction, it will be feasible to make enough methane and oxygen from CO2 to fuel the way home. 3) The Boring Company tunnels are another process that will be needed on Mars. (And electric cars, for that matter. ) Musk is no doubt testing out all his new technology with Mars in mind. So I think it is reasonable to expect that he will minimize petroleum extracts and maximize recycling carbon that is already in the atmosphere on earth, as quickly as possible. OSLO, March 22 (Reuters) - Norway said on Thursday it wants to buy electric passenger planes in the coming years to help slow climate change, building on its success with big tax breaks that have made it the world leader in electric car sales. State firm Avinor, which runs 45 airports in Norway, said the commitment to battery-powered aircraft could encourage development of electric and hybrid technologies by companies such as Airbus or Boeing. "In my mind, there's no doubt that by 2040 Norway will be operating totally electric" on short-haul flights, Dag Falk-Pedersen, head of Avinor, told reporters at an aviation conference in Oslo. In five years, if you want to take a trip from San Francisco to San Diego, it may be possible to do it on a small electric plane–and with a ticket that costs less than driving or taking the train. The Israel-based startup Eviation, which is building a new all-electric, nine-seat airplane, called the Alice Commuter expects to begin making its first commercial flights in 2021 and scale up to hundreds of routes across the U.S. over the next few years. They should rename the company Liberty Air and specialize on flights between US naval bases.